Welcome to JSW Media Inc. Welcome to the JSW Media Inc. website. Jeff Wasserman, founder of JSW Media is a pioneer in digital content creation, distribution and management. For the past 10 years, Jeff's focus has been assisting category specific professionals and businesses to digitize their way into the future. Jeff's goal has been to assist his clients to use the web to expand their business and remain connected 24/7 to their customers and clients. Over the past few years, the business has evolved and grown through word of mouth and trade associations. JSW Media serves a niche market like no one else. We are small enough to handle start-ups and part time ventures and big enough with our strategic alliances to handle large scale projects ranging from privately held corporations to Fortune 500 corporations. The day of "one-size-fits-all" marketing, media and advertising is quickly becoming a thing of the past. Today, consumers are multitaskers and prefer to receive their content from as many channels as possible. JSW Media can create, produce, distribute and manage your online digital content. The challenge facing most traditional media production and distribution companies is simply how to monetize the digital content distribution. JSW Media specializes in helping companies transition from a subscription based model to a ad-based revenue model. From broadcasting to entertainment, JSW Media can assist you in your digital content production and distribution needs. We offer print and online advertising, media design, distribution, media sales and consulting. Please consider JSW Media for your next creative marketing project, building online visibility, attracting new customers, building consumer relationships and boosting your business. 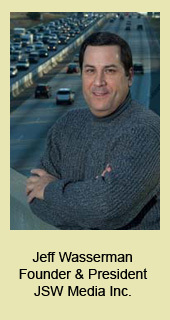 Jeff Wasserman and his associates are here to help you with your media, marketing and advertising needs. Call 706-864-2111 for more information. JSW Media is looking to partner with one or two large clients to offer a very unique direct-to-consumer marketing opportunity. This is a very positive, well respected, consumer friendly advertising, mobile marketing, nationwide project. This marketing project will be 18 months in length and cover the entire United States, from coast to coast. If you would like more information on this unique marketing concept, please call Jeff at JSW Media, 706-864-2111.